To try and offer higher levels of efficiency, Land Rover is providing the fifth generation version of its large Discovery SUV with a four cylinder Sd4 diesel engine. The experts at Car & Driving check out what's on offer. Land Rover faces ever tougher competition whenever it launches the next incarnation of its Discovery. With this fifth generation model, there are rivals from all corners that offer a sporty drive, great off-road ability or a luxury experience. Yet none of them quite combines all of those elements in one package the way the Brit does and this is what has always made the Discovery stand head and shoulders above its rivals. This MK5 model is mostly made from aluminium. That's helped shave 450 kilograms from the car's weight, which makes it much better on fuel consumption and more agile to drive. There are also new motors under the bonnet, including the 2.0-litre Sd4 turbodiesel we're going to look at here, a unit that aims to keep this large SUV firmly among company car drivers' choices. It feels wonderful to be sat in the driver's seat of this Land Rover Discovery. It gives a great view of the road ahead and all around, so you feel safe and in complete control. That sensation is helped along by the way this fifth generation model behaves, which has a lot to do with it being 450 kilograms lighter than its predecessor thanks to ditching a separate chassis in favour of an aluminium core structure. As a result, it goes round corners with little body lean and, thanks to its air suspension, glides over bumps that would upset some its rivals. Of course, this is still a large SUV, so some care is needed when negotiating narrow entrances, but a turning circle of 12.3 metres aids the Land Rover to nip through town and along country lanes with equal composure. As for the motorway, you'll find it stable and very hushed in the cabin. The calm inside the Discovery has a lot to do with what's under the bonnet in the shape of the engine line-up. Most buyers will choose the 2.0-litre 'Sd4' turbodiesel unit we're looking at here - this is the smallest diesel motor every fitted to this green oval model. Mind you, it packs a big punch courtesy of 500 Newton metres of torque that arrives at a mere 1500rpm. You never have to work it hard and there's always enough oomph for overtaking, towing or cruising. Use its full potential and 0-62mph comes up in 8.0 seconds. As with all Discoverys in this range, an eight-speed automatic gearbox is fitted that assists with ease of driving and maximising efficiency. Since the day it was launched, the Discovery has always had a unique look that's not just set it apart from its rivals, but also made it stand out from the other models in Land Rover's line-up. This fifth generation design moves much closer to the rest of the range and shares much of its inspiration with its smaller Sport sister. Good or bad move on the company's part? That's up to you to decide, but at least there are some of the classic Discovery cues in evidence - the rear C-pillar and the stepped roof for instance. Once installed in the driver's chair, you have a commanding view of the road ahead and to the sides thanks to the elevation and large glass area. The main instrument display directly in front of the driver consists of an analogue speedo on the left and rev counter over on the right-hand side. Both are simple and clear, while in the centre is a digital display for fuel level and water temperature. Anything this can't tell you will be found on the centre-dash 'InControl Touch' colour touchscreen. As for the rear of the car, there's plenty of space in the second row - and adult-sized room in the fold-out third row seats too - which is unusual, even with large larger 7-seat SUVs. As for luggage space, well there's lots of it - up to 1,137-litres with the first two seating rows in place, or up to 2,406-litres with just the front seats in use. The Discovery may have steadily become plusher with every successive generation, but Land Rover still pitches its prices that little bit below most of its key rivals. As a result, you'll need £44,000 to drive away in an entry-level model with the 2.0-litre 'Sd4' turbodiesel engine. As with every model in this fifth generation range, that includes an eight-speed automatic gearbox and full-time four-wheel drive, as well as the dirt-defying 'Terrain Response' system. As for equipment across the range, well even the base 'S' model gets you 19-inch 'five split-spoke' design alloy wheels, halogen headlights with daytime running lamps, a heated windscreen and door mirrors with integrated puddle lights. The 'Brunel' front grille has a 'Narvik Black' plastic surround and there's more of the same for the wing vents and lower bumper sections. At the rear, a 'Powered Tailgate' takes the effort of out of opening the boot and there's also a 'powered Inner Tailgate' panel that drops down to make loading larger items easy. Body-coloured door handles lift the exterior appeal, while inside there's cloth fabric on the seats and eight-way manual adjustment for the front pews. Every Discovery comes with seven seats as standard in a 2-3-2 layout. Land Rover has made huge strides in making its cars more efficient and cheaper to run for its owners. At the heart of this push is a switch to an aluminium construction for this fifth generation Discovery. It saves 450 kilograms compared to the old model and, if you want to know how much that is, it's the equivalent of five rugby-playing passengers being removed from the weight of the car. As a result, it means this Mk5 model can now be offered with the 2.0-litre 'Sd4' turbodiesel engine we've been looking at here, a unit that offers 43.5mpg combined consumption and 171g/km of carbon dioxide emissions. Now, those figures are not quite as good as some in this sector, but you should bear in mind this British SUV comes with seven seats, an eight-speed automatic gearbox and full-time all-wheel drive as standard. Every model has 'Stop-Start' that automatically turns off the engine when the car is sat still in traffic. As soon as you release the brake pedal to press on the accelerator, the engine fires up ready for the off. The diesel-fuelled versions use 'AdBlue' to lessen the impact of the tailpipe gases. This works by injecting a urea-based solution into the hot exhaust that turns the harmful chemicals into water. You can top up this solution's tank yourself or any Land Rover dealer will fill it for you when required around every 9000 miles. Is the Land Rover Discovery the ultimate large SUV? For many, the answer was already a resounding "yes" and we'd have to agree it's a tough act to better. The world just seems a better place when you're sat up in its commanding driver's seat. Whether you're heading to the shops, on the school run or a skiing holiday, this four by four does the lot with a relaxed ease that makes most rivals seem well behind the curve. 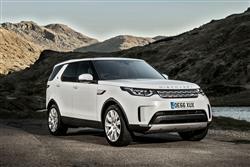 Of course, it helps that Land Rover has made this fifth generation model lighter and even more packed with driver aids. Plus it's easier on running costs in this four cylinder Sd4 form. In summary, the Discovery is one of the most sophisticated, connected and just plain brilliant full-size SUVs you can choose. Noting quite matches the classless way it goes about its business.